Rafael Silveira is a fine artist with a strong background in the graphic arts. The majority of his works consists in oil and acrylic paintings that mixes a classical atmosphere with a contemporary techniques and subjects, especially cartoon imagery. Rafael was born in Paranaguá, Brazil and he began drawing comics in 1990, which were featured in numerous independent publications throughout Brazil. By 2000, his interest turned toward illustration for magazines and advertising campaigns in Brazil and Europe. He studied fine arts at Federal University of Parana and received a degree in advertising from Centro Universitario Curitiba in 2002. In 2004 he began to paint with oil, and in the years since, his fine art works have been exhibited in prominent Brazilian galleries and are included in numerous collections such as the Museum of Modern Art in Rio De Janeiro. Silveira is a three-time winner of the Max Feffer Design Award. With an explosion of past and modern iconography melding together in an effortlessly unified pieces, Silveira blurs the lines of time in his billowy soft dreamscapes. Through Silveira’s time warped compositions a bevy of classically rendered botanicals and tropical birds drift alongside fruit loops and 50’s inspired brassieres, creating a visual collision between the natural world and man-made notions of elegance. Like a vacation gone array, Silveira’s seemingly out of place subjects seem to harbor a sense of content amidst the chaos, embracing the voyage into worlds beyond their own. A hallmark of Silveira’s work is the use of sculptural frames to compliment his canvases. 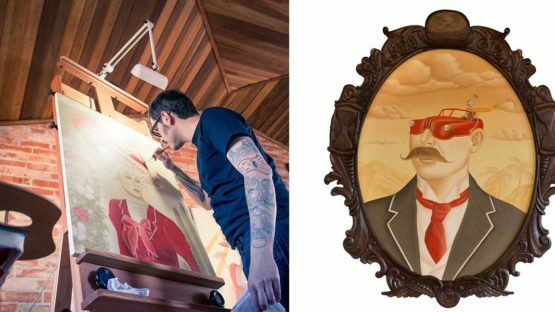 The custom frames are designed by Silveira and carved out of wood by traditional master craftsmen who specialize in creating religious altars and ornate furniture. This unique collaboration brings the imagery of his paintings into the third dimension and allows for an interesting interplay between each external structure and what they contain, within. He lives and works in Curitba, Brazil.